Moana 2016-yil Amerikaning Walt Disney Pictures tomonidan ishlangan 3D kompyuter-animatsion musiqa sarguzasht film. Film Disney animatsion badiiy filmlarining ellik oltinchi filmi hisoblanadi. Animatsion film rejissorlari Ron Clements va John Musker boʻlib, ovoz berganlar Auliʻi Cravalho, Dwayne Johnson, Rachel House, Temuera Morrison, Jemaine Clement, va Nicole Scherzinger. ↑ Fleming Jr, Mike (March 24, 2017). No. 12 'Moana' Box Office Profits – 2016 Most Valuable Movie Blockbuster Tournament. Deadline Hollywood. March 25, 2017. ↑ Moana (2016). The Numbers. March 25, 2017. ↑ Moana (2016). Box Office Mojo. August 28, 2017. 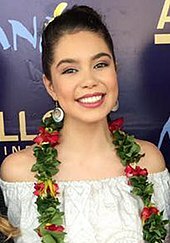 ↑ Auli'i on Instagram: 'Aloha nui kākou! Eia nō hoʻi au ʻo Auliʻi Cravalho ma Nuioka nei. A piha ʻeu ka hauʻoli i ka hana hou ʻia ʻana ʻo Moana... a i kēia…'. Instagram. ↑ Speak Māori (June 8, 2017). Te Reo Māori Moana Casting. ↑ Moana / English cast. CHARGUIGOU. ↑ Nicole Scherzinger on Instagram: 'I'm over the moon to announce I'll be joining @auliicravalho again for @disneyanimation's MOANA!!! This time the entire film in ʻōlelo...'. Instagram (en). Wikimedia Commonsda Moana (2016 film) mavzusiga oid turkum mavjud. Bu sahifa oxirgi marta 19-Oktabr 2018, 13:33 da tahrir qilingan.